Nestled in the heart of Oak Cliff lies an entertainment venue engrained in the history of the community. After suffering years of decline and neglect, the structure is seeing new life through creative programing and sensitive restoration, ensuring it will remain a vital anchor of the neighborhood. Today we travel behind the scenes at one of the region’s most interesting movie palaces… the Texas Theatre. 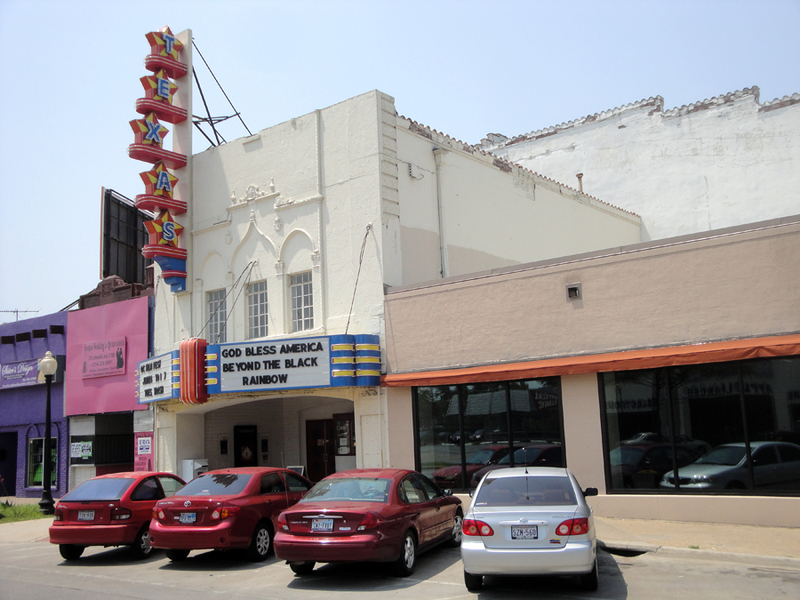 The Texas Theatre on Jefferson Boulevard as it appears in 2012. The lobby extends to street level with the auditorium behind. BeginningsThe community of Oak Cliff — isolated from the rest of Dallas by the Trinity River — grew up as an independent neighborhood lacking the full entertainment options found in the city. While smaller theaters existed in the community, major events, film debuts and performances were always hosted by the largest vaudeville and movie palaces on “Theater Row” in downtown Dallas. Seeing a need for more entertainment options in Oak Cliff, long-time resident and visionary C. R. McHenry (locally known as “Uncle Buck”) teamed up with other local entrepreneurs to form the Oak Cliff Amusement Company and construct a new theater for the area. 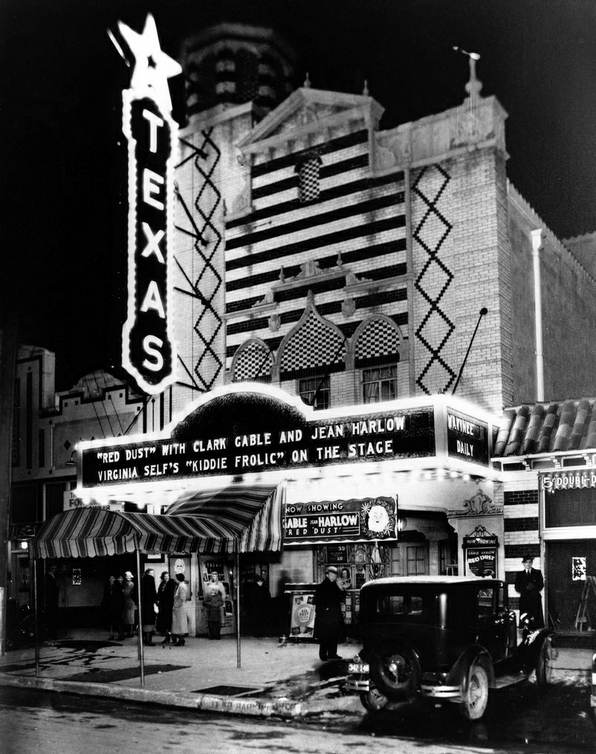 The Texas Theater as it appeared in 1931, featuring exotic Venetian design details. Opened on San Jacinto Day (April 21) 1931 the new Texas Theater, later renamed Texas Theatre, became the largest suburban theater in Texas and the heart of Oak Cliff’s “Amusement Row” on Jefferson Avenue. With 2,000 seats including 586 in the balcony, the auditorium had one of the largest lower floors in town; the theater was only surpassed in size by the Majestic and Palace in downtown Dallas. On opening day excitement for the new theater was so great that community celebrations were extended to accommodate all of the crowds. Decorative sides of the original proscenium arch still survive in the auditorium. The first of the deluxe neighborhood theaters, the Texas Theater became an important community asset bringing first-class entertainment to Oak Cliff. As part of the R&R Circuit (a subsidiary of the Howard Hughes and Harold B Franklin-owned Hughes-Franklin Circuit), the theater ran an all-sound policy focusing on first run films for the community. A full staff of uniformed ushers provided services expected in the fancier theaters downtown. One such luxury was the innovative ventilation system, which blew 200,000 cubic feet of air per minute through a water-cooled system pumped from a 4,000-gallon tank. 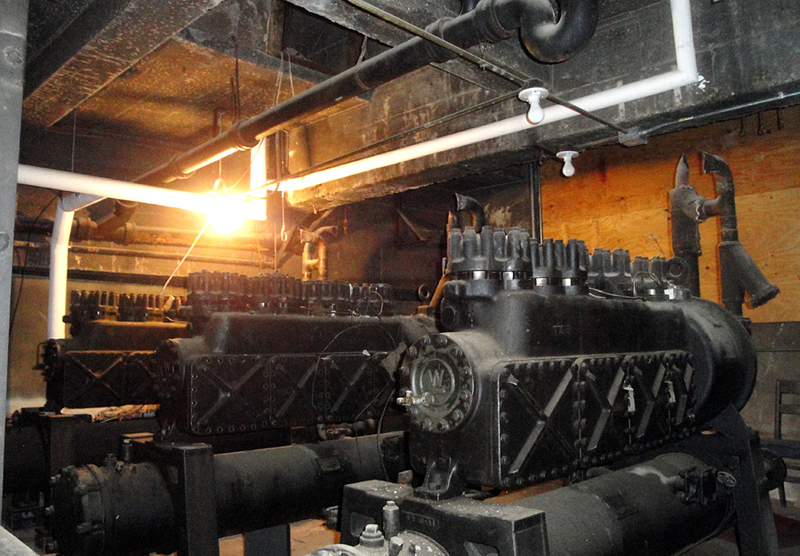 The cooling system made it the first theater in Dallas with air conditioning. 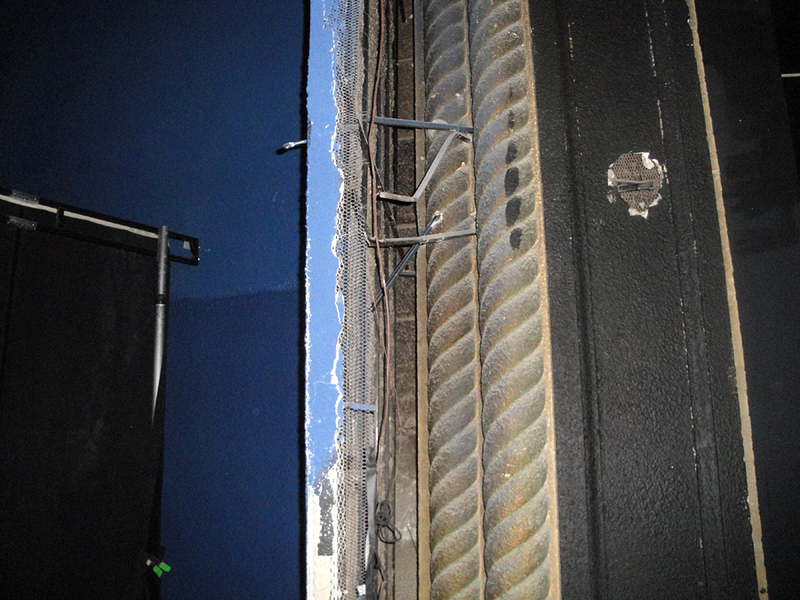 The Texas was the first air conditioned theater in Dallas; the original equipment is still in place (long since updated). “Uncle Mac’s Texas Theater” — which boasted the largest auditorium in Oak Cliff — became the center of community activities and hosted many events in addition to regular film screenings. Shortly after opening in 1931, a beauty contest at the Texas Theater selected a local representative for the International Pageant of Pulchritude (“Miss Universe” Contest) in Galveston. Twelve women finalists went through a rigorous selection process to compete for the title of “Miss Oak Cliff.” Many local organizations and churches used the auditorium for special events and benefit shows, and it became a common venue for school graduations accompanied by live performances. The theater also helped in the war effort; in 1941 free admission was offered to anyone depositing aluminum (such as pots & pans) for national defense collection. The auditorium was unusually wide, featuring 2,000 seats on the ground floor and balcony. Other events were more promotional in nature, advertising new films and local merchants. The Oak Cliff Manufacturer’s Exposition featured a variety of local goods made in Oak Cliff. And on the Wednesday evening before Thanksgiving live turkeys were turned loose in the Texas Theater; turkeys that were caught became dinner for the lucky winners. Designed by noted theater designer W. Scott Dunne (who designed many other theaters in the region), the business team spared no expense in bringing luxury entertainment to Oak Cliff. As the first Dallas theater built for talking pictures, it featured the latest development in sound and projection features, including the first stage in Dallas built for a three-dimensional screen which could easily be moved and repositioned. A special auditorium design — including new “noiseless chairs” — eliminated excess noise so that patrons could fully enjoy the sound system. A $10,000 Barton theater organ was largest in Dallas outside of Fair Park auditorium, although it never accompanied the silent films it was designed for. Upon entering the lobby, guests were transported to a Venetian landscape featuring balconies and special lighting effects. The 33-foot high neon sign on Jefferson Boulevard was the only “Texan” element of the theater. Instead of a Spanish colonial or Southwestern theme, Dunne chose a highly-ornate Italian Renaissance design. Focusing on the architecture of Venice, the exterior featured a striped, two-toned brick facade and large cupola on the left tower. The interior lobby resembled a Venetian courtyard surrounded by indirectly lit tile-roof buildings. Blue inlaid panels gave the effect of water in canals, and special effects created the illusion of canals flowing under bridges. 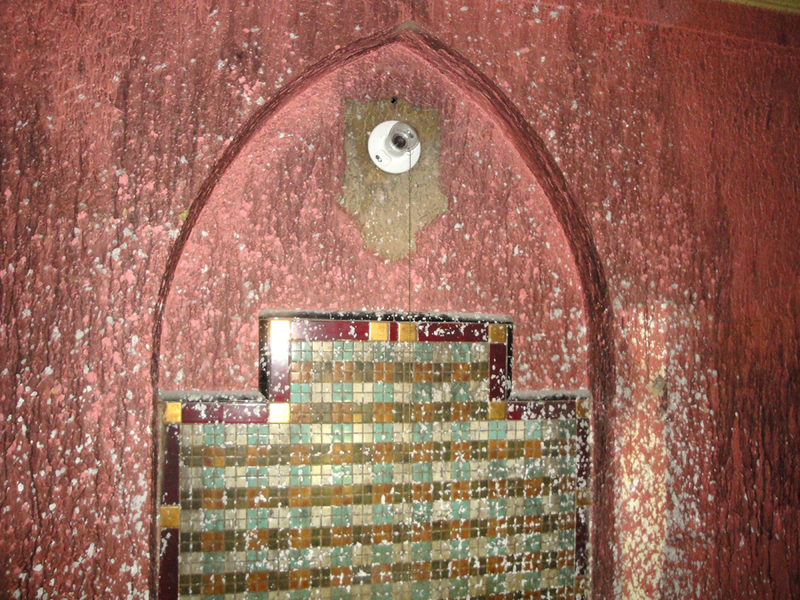 An original fountain hides behind a closed door, long forgotten. The outline of a wall sconce is also visible. Bright, vivid colors were chosen to give the theater a modern feel — departing from the darker, heavy tones of older theaters in Dallas. Completing the atmospheric effect seen in many of Dunne’s designs, theater patrons were seated beneath a painted Italian ceiling featuring twinkling stars and projected clouds. The large proscenium arch surrounding the stage was integrated into facades of Venetian buildings on either side. 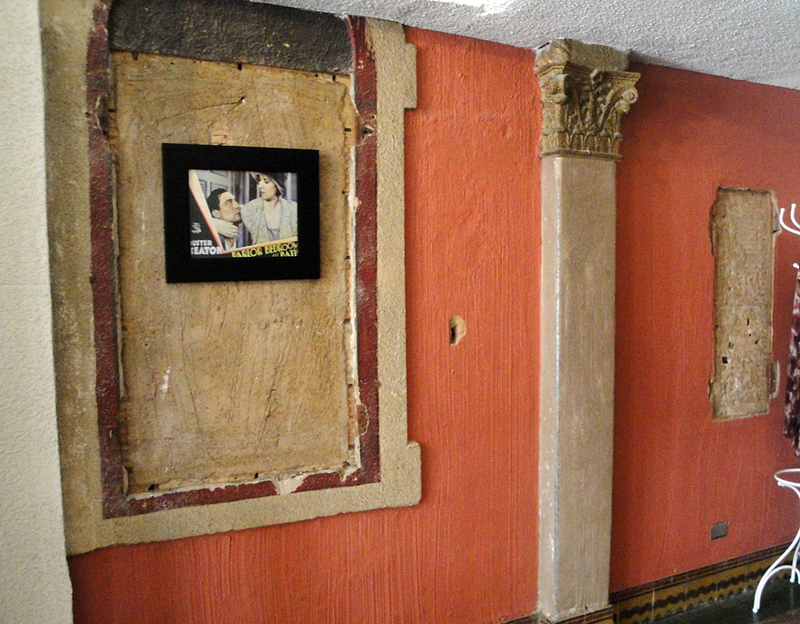 One section of lobby wall has been restored to reveal the original decoration and paint colors hiding behind the stucco. 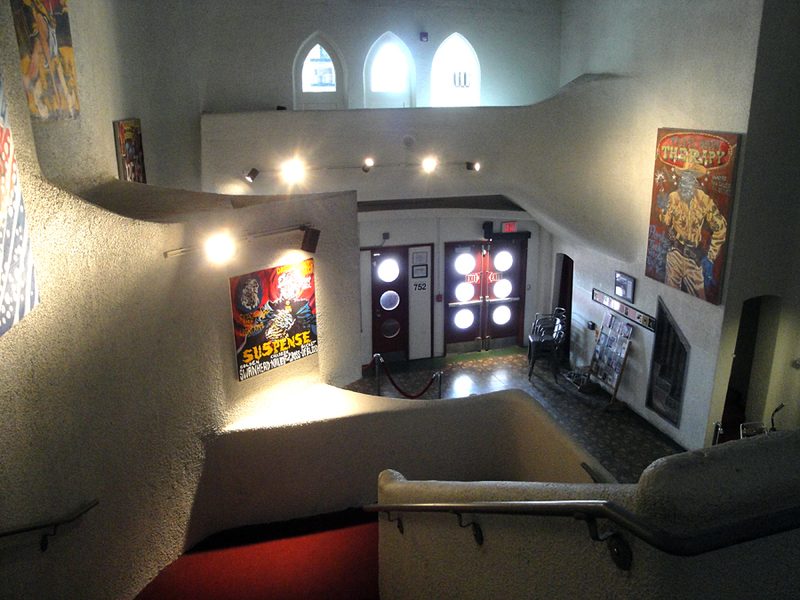 The Texas Theater’s layout set the auditorium at a right angle from the entrance and lobby. This provided for an unusually large amount of public space on two levels with several balconies overlooking the lobby. Wrapping around shops fronting Jefferson, a secondary theater exit on the east end led to the street through a retail arcade. While much of the original layout still remains, the elaborate designs and Venetian theme were unfortunately lost in later years. Storefronts line an old retail arcade at the front of the auditorium. Today the Oak Cliff Cultural Center uses this space. The Texas Theater evolved with the times, installing a high-fidelity audio system (Western Electric’s “Mirrorphonic”) in 1936. The theater was a big sponsor of local film productions, and hosted the premier of “Secrets of a Co-Ed” — the first Dallas-made talking film. 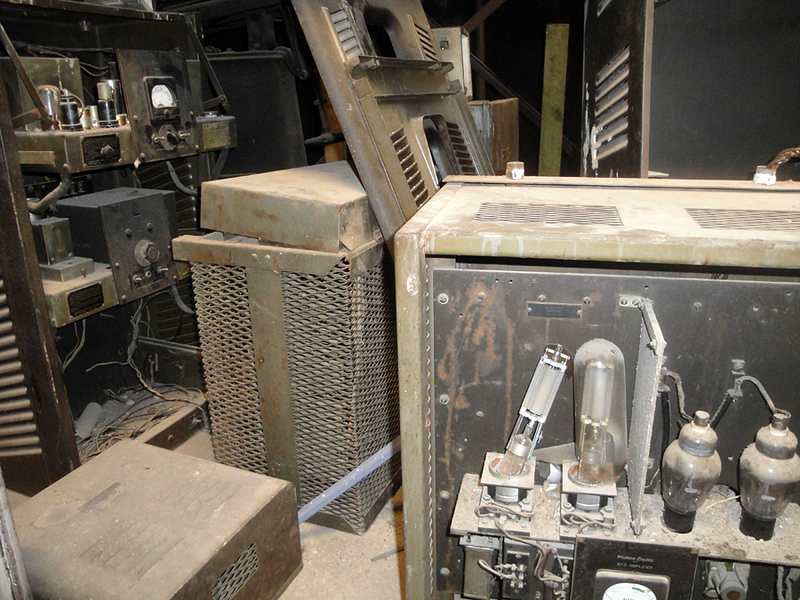 Various audio equipment — once state-of-the-art — remains hidden in storage areas of the theater. 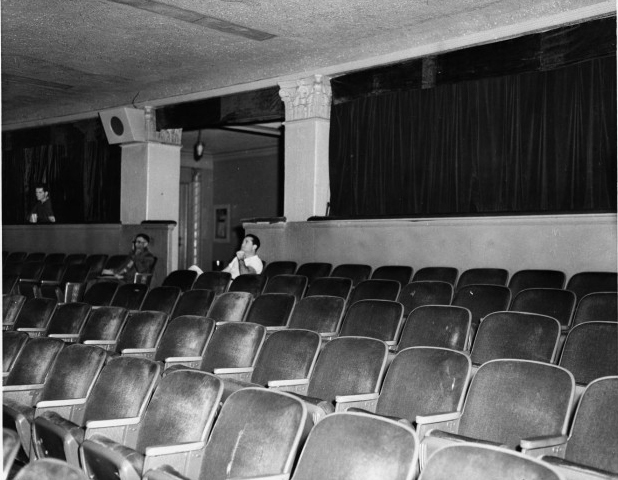 By 1953 the theater was in need of small updates, and it closed to customers for five days of redecorating. The resulting improvements included 1,700 new seats spaced for better leg room and an enlarged stage over the old orchestra pit. 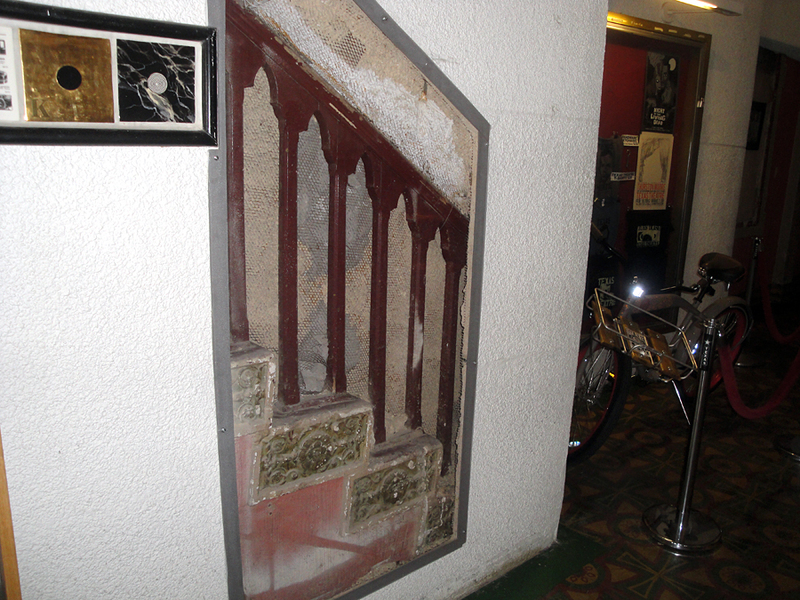 These minor updates redecorated the auditorium but kept most of the original theme and architectural elements intact. The Texas Theater was thrown into the global spotlight on November 22, 1963 — the day President Kennedy was assassinated in Dallas. Ninety minutes after the fateful gunshots in Dealey Plaza, Lee Harvey Oswald was captured in the theater’s auditorium by Dallas Police Officer Nick McDonald. A local store manager had noticed a man slipping into the theater without paying and notified the ticket clerk; when police arrived, Oswald was found in a seat near the rear of the auditorium. The auditorium, as it appeared in 1963. Lee Harvey Oswald was captured in this rear section of seats. The tragic event of 1963 cast a dark stigma over Dallas that lasted many years. Sites related to the assassination were deeply affected, and the Texas Theater’s association with the event triggered a long demise. A major remodeling in 1965 tried to distance the theater from its past. The interior was ripped out and repositioned, relocating stairways, adding restrooms and expanding concessions. The original Venetian design elements — handrails, bridges and towers — were covered with bright white stucco. In the auditorium, chairs were reupholstered and the design was simplified. 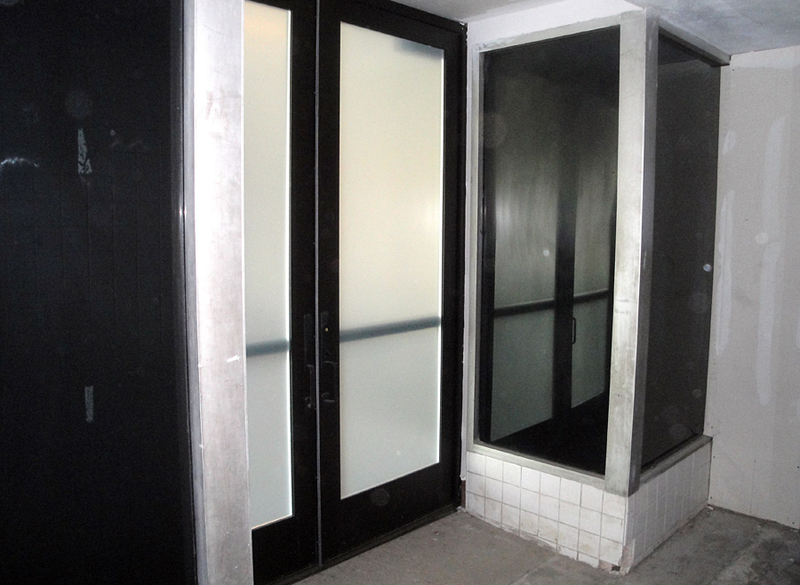 The box office was even moved inside the lobby — one of the firsts for Dallas — by adding doors at the front of the building. Outside, the facade was mutilated by removing the towers and covering brickwork with two large stucco arches. The “great cover-up” placed stucco over the interior, hiding original staircases and decorative elements. Here, one section has been revealed. The changes weren’t enough to keep audiences interested as other modern theaters opened in the area, and the Texas was closed by United Artists in 1989. After being purchased by the Texas Theatre Historical Society, the front was partially restored for Oliver Stone’s film JFK in 1990. Though plans for a full restoration were proposed, lack of funds caused the theater to change hands and remain closed. The theater opened briefly under new ownership until a five-alarm fire nearly destroyed the structure and forced it to close again in 1995. 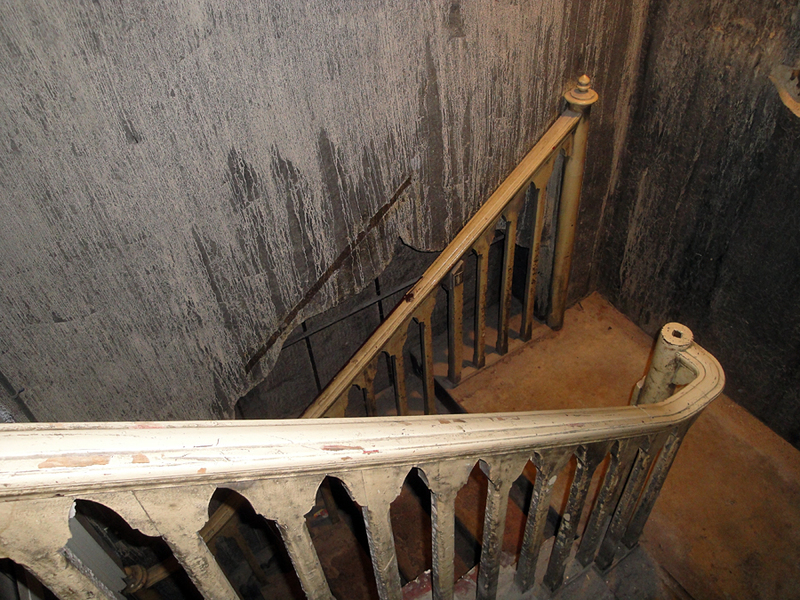 Evidence of the 1995 fire can be seen in this stairway, which contains original wooden railings and moorish openings (now hidden from the public behind stucco). After several failed attempts at restoration, the Oak Cliff Foundation purchased the building in 2001 and the Texas Theatre was added to the National Register of Historic Places in 2003. Many of the public areas were cleaned and restored for use. A more intensive restoration to take the building back to its earlier decoration was left for another phase, but a reproduction sign and marquee based on the 1963 appearance was added. 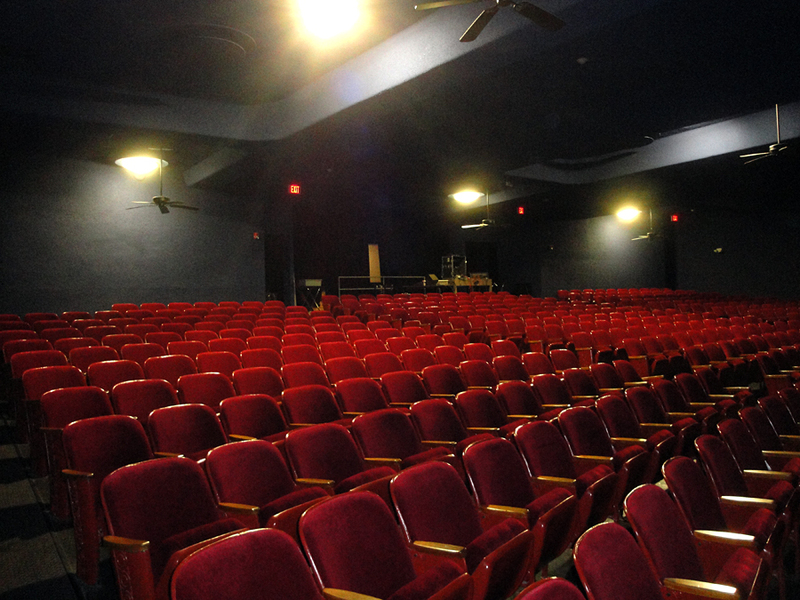 In 2010 Aviation Cinemas, Inc began operating in the space and the reborn Texas Theatre was opened to the public. During the same year adjacent retail space was also transformed into the new Oak Cliff Cultural Center. 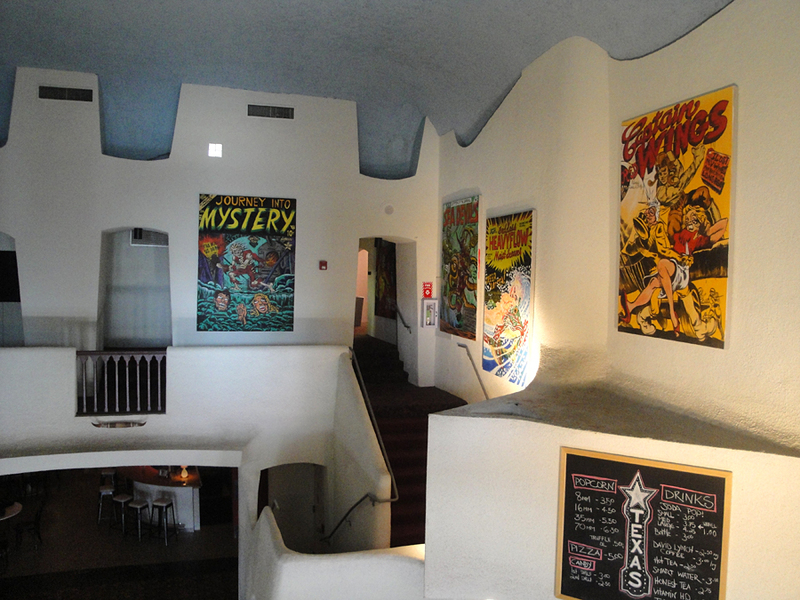 The upper level of the lobby is decorated with colorful artwork inspired by classic cinema posters. As part of the improvements to the historic space, Aviation Cinemas added an expanded concessions areas and prohibition-style bar (complete with record player) that has become a popular hangout for film geeks and local residents. 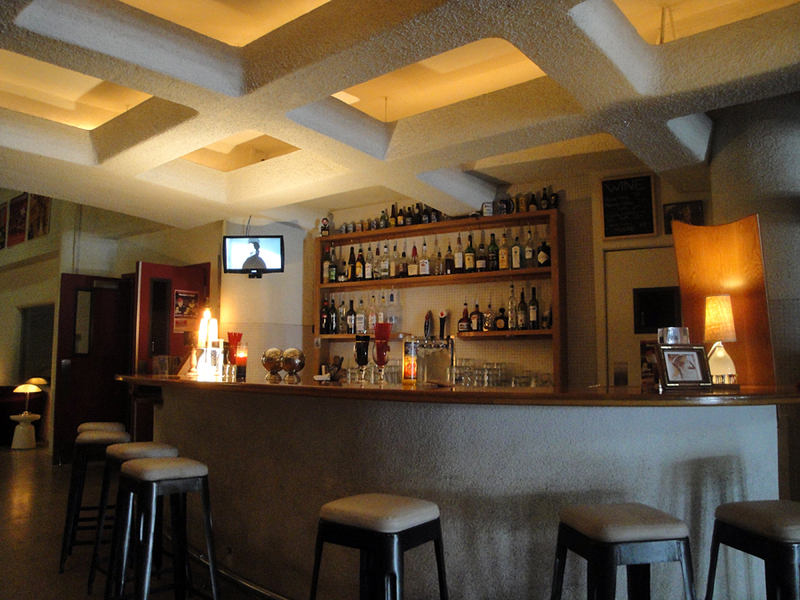 The lounge — open every evening — also welcomes those who want to stop by for a drink without watching a film. Now functioning as an art house cinema, the Texas serves as a gathering point for filmmakers and promoter of the local film community. 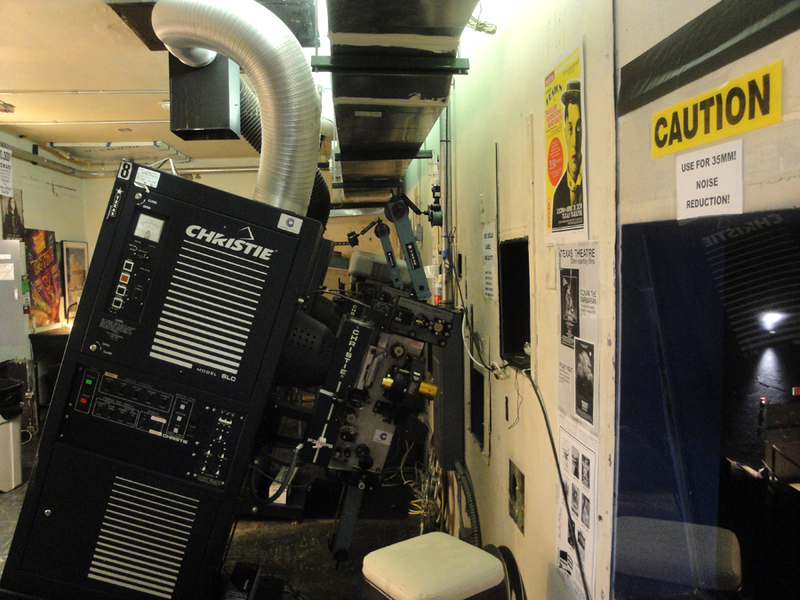 Along with digital capabilities, a 35mm film projector added in June 2011 allows the theater to showcase vintage archive prints alongside first-run indie titles. Smaller, unusual screening rooms are often set up for special showings. And the spotlight will be on the theater during its role as festival headquarters for the First Annual Oak Cliff Film Festival (scheduled to run June 14–19, 2012). The Texas Theatre has long been an icon in Oak Cliff. After suffering a slow demise and serving as witness to a tragic time in Dallas history, the programing and unique events at the reborn theater have made it a successful feature for the region. As patrons again discover this cultural treasure, its preservation will support future reinvestment in the neighborhood and encourage growth of the local indie film scene… all while providing the entertainment envisioned by its founders. View more photos of the Texas Theatre here. Also, compare the Texas Theatre to the Ritz Theatre discussed here (both were designed by W. Scott Dunne). 6 Responses to "Texas Theatre"
This is what the Palace, the Capitol or the Tower theaters should have become for downtown if any had survived. Since they didn’t, the Texas Theatre is the closest thing we have to a Theater Row movie palace. This is a very special place. GREAT job, Noah! This is probably the best, most comprehensive history of the Texas Theatre I’ve ever seen. Two notes, McHenry was known as “Uncle Mac” and the organ in the Texas was originally in the Midway theater down the street and was moved to the Texas when it opened.